The garden setting is an enviable combination of meadow grassland and deciduous woodland. Landscaping was part of a major renovation project. The brief was specific. The garden traditional fence and garden to the front of the former cottage was to be completely removed and replaced with a modern, open layout, giving more visibility to the property. Save for a Japanese Acer and an ornamental Cherry, all the existing shrubs were in poor condition and had to be replaced. The fencing and gates were repositioned and replaced with a more open style. The area at the side of the house was extended to incorporate part of a meadow, and the whole lot regraded to a higher level. 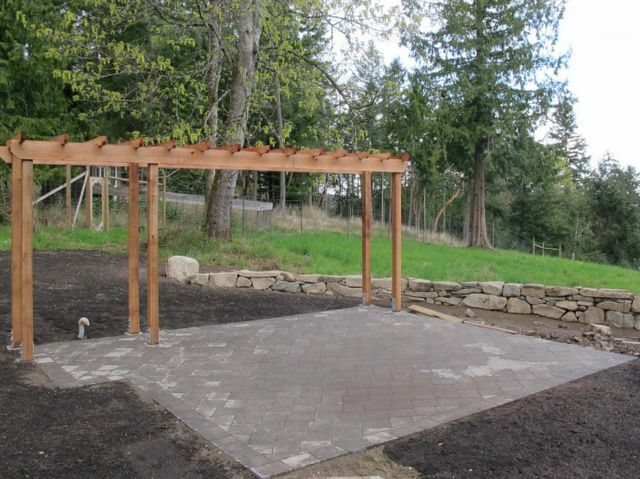 The first stage of landscaping involved the construction of the stone wall, seeding the enlarged grass area, patio and pergola.